UFC 160: Velasquez vs Big Foot Fight Pick & Preview | MMA Fighting Events Videos Techniques UFC Fight Picks and News. 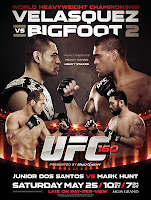 This Satuday, Antonio "Big Foot" Silva gets a rematch and a chance to avenge a loss where he was plain and simply demolished by UFC Heavyweight champion Cain Velasquez. This MMA fight is taking place at the MGM Grand Garden Arena in Las Vegas, Nevada. Let's take a closer look at these two fighters and then I'll make my UFC 160 fight pick. Antonia "Big Foot" Silva was demolished in their first fight, but since then he's earned his way back into a title shot and rematch with two straight UFC knock out wins! Silva has an overall record of 18-4 and he definitely shows up to finish fights. 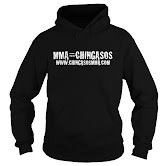 Of those 18 wins, 13 have come way of KO or TKO, and three via submission. Antonio "Big Foot" Silva is a huge fighter. He comes in at 6' 4" and hits the UFC heavyweight limit at 265 lbs. His size, strength and knock out power are just a few of his weapons. Silva also has a high level BJJ game which he uses to gain position on other fighters. Cain Velasquez comes into this fight after just regaining his UFC heavyweight title in a fight where he avenged the only smudge on his record. Velasquez used his gritty in your face smothering style to overwhelm Junior Dos Santos for five rounds. This style of fighting helped Velasquez run through the UFC Heavyweight division on his way to the title, and after a brief set back to JDS, helped him recover his title. Cain Velasquez has the best wrestling in the UFC Heavyweight division. Strong wrestling was his base and he's only improved his overall MMA game by adding sharp boxing skills to the mix. He also has an incredible gas tank. He has the ability to push forward and grind down other fighters like no other heavyweight. This fight is going to come down to speed. Velasquez is a lot smaller than Big Foot but he's also a lot faster and he'll use that speed to dictate the fight. Sooner or later in this fight he'll wear down Silva, bring home another victory and hold on to the UFC Heavyweight belt! Agree? Disagree? Feel free to comment with your thoughts on UFC 160.